I’ve been tying for a decade and half now, my specialty is flies that fish well in Northern New England and the Florida Keys. 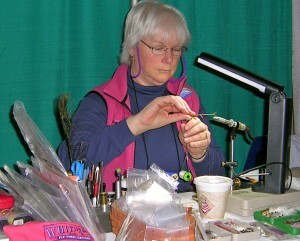 I started with the basics, progressed to Classic Maine Streamers and now onto Salmon flies. Having the good fortune to become a member of United Fly Tyers’ when I started tying enabled me to receive instruction from some of the finest tiers in the industry. Several years ago they encouraged me to start teaching, that lead to demonstration tying, a stint as Editor of the Roundtable, then President, and currently an Adviser to the club. Now I have a small group of guides in New England that I tie for as well as giving instruction, presentations, and demonstrations around the country. I’m also a member of several pro teams including, Whiting Farms, Daiichi, and Nymph-Head Beads, which I represent at 12-15 events per season. I truly enjoy sharing my knowledge and encouraging new folks to join the fly fishing experience.